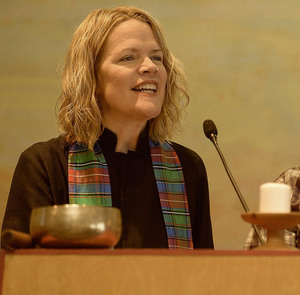 Reverend Caitlin O’Brien joined the All Souls staff in July 2012. In the 15 years prior to joining our staff, she served in direct care and management roles in organizations that support the healing, rights and self determination of immigrant laborers, survivors of domestic violence and sexual assault, people facing homelessness, and those ill or dying in hospital and hospice care. Rev. O’Brien works 20 hours a week at All Souls, primarily providing pastoral care and coordinating the efforts of the Caring Team, as well as serving on the Worship Team. She lives in the New Haven area with her spouse and two young children. You can contact Reverend Caitlin at associate.minister@allsouls.net. For more information about the Caring Supports at All Souls please click here.